Fridays roll around very quickly these days! It could be that it's summer and the days go by so fast. Whatever the reason, here we are ready for this weeks French Friday recipe again. On the schedule for this week is Citrus-Berry Terrine. I was quite happy with this pick. I know gelatin salads have lost their favor in our modern culinary culture...but I love gelatin salads. I have a recipe for a Strawberry Jello Salad, served with a sour cream dressing, that is so wonderful. It was often requested when we had a buffet or pot luck dinners. I haven't made it in years. I just never think about it anymore. That is, until last night as I was making this terrine. I really enjoyed this recipe and it was pretty easy to put together. 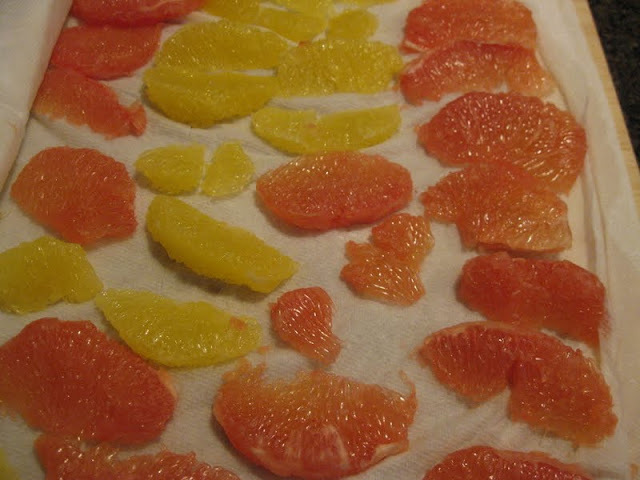 The most time consuming part was peeling and sectioning the oranges and grapefruit. After that it was a breeze! You have to put the initial gelatin mixture in the fridge for about 2 hours and stir every so often so that it wouldn't gel too much. I forgot mine in the fridge for an extra 1/2 hour. Definitely over jelled! I decided to microwave it for about 40 seconds. That worked great and was just enough to soften the mixture, so I could add the fruit. After adding the fruit you place the mixture into a loaf pan and refrigerate again for several hours or overnight. We really enjoyed this dish. It was light and perfect for a hot summer night! It might even redeem gelatin salads! 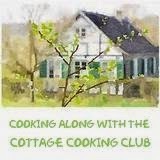 This recipe is from Dorie Greenspans book 'Around My French Table". You could also find it here. To see how other Doristas did check out here. I have never made or had fruit terrine. Looks so delicious and tempting! Great tip with microwaving the gelatin! Your terrine looks fantastic! This gorgeous fruit terrine isn't anything like the jello molds I used to make years ago, although it's an update with the beautiful fresh berries, and citrus fruits. That's quite a tedious project Kathy, but you tackle them all with grace and style! Your fruit terrine came out lovely, makes me want to give this recipe a try! Your terrine looks like the one in the book, Kathy. It looks fantastic! You will have to share your strawberry jello-o salad recipe with us. It sounds wonderful and I am with you I love jell-o and even though I had fits with this one because I tried different fruit than the recipe called for, it was fun experimenting to flavor the gelatin naturally with the fruit. Have a great weekend! I had the same thought as Elaine. Your terrine looks just like the one in the book. I'll bet the currants were great in this. I am always trying to figure out what to do with them, though this year, our bushes failed to have any fruit :( Nice job! Had to giggle again when you posted about your husband...wondering what mine will say about the fish in the jar??? Your terrine looks perfect, Kathy! Your terrine looks lovely! And thanks for the tip about microwaving the gelatin. Mine set too quickly, so that's good to know for next time. Love your terrine, Kathy! I am intrigued about the sour cream dressing you used to serve with your jello salads. Sounds wonderfully tart next to the sweet jellied fruits. love how pretty all the berries look in your terrine!! nice job!!! !